French consul; born at Strasburg Oct. 27, 1786; died at sea Sept. 18, 1842, on a voyage from New York to France. Being fond of travel and foreign languages, he obtained (in 1809) the appointment as secretary of the imperial commissariat in the Ionian Isles. 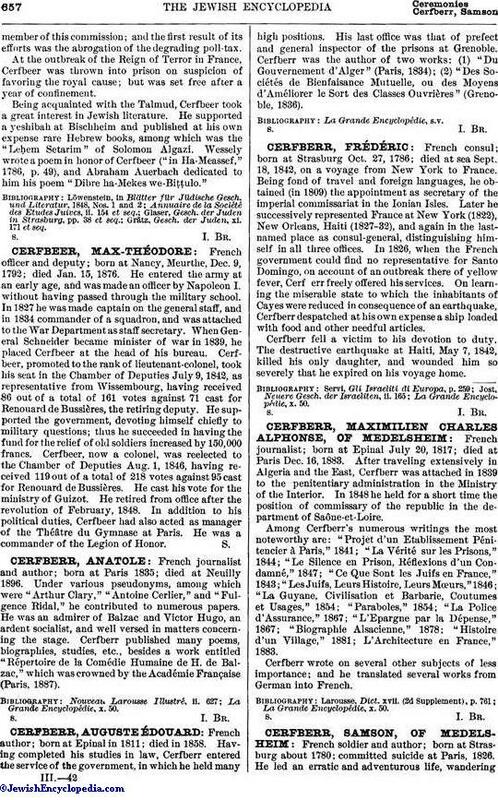 Later he successively represented France at New York (1822), New Orleans, Haiti (1827-32), and again in the last-named place as consul-general, distinguishing himself in all three offices. In 1826, when the French government could find no representative for Santo Domingo, on account of an outbreak there of yellow fever, Cerfberr freely offered his services. On learning the miserable state to which the inhabitants of Cayes were reduced in consequence of an earthquake, Cerfberr despatched at his own expense a ship loaded with food and other needful articles. Cerfberr fell a victim to his devotion to duty. The destructive earthquake at Haiti, May 7, 1842, killed his only daughter, and wounded him so severely that he expired on his voyage home. La Grande Encyclopédie, x. 50.